A green laser beam hitting a mirror at an angle close to zero degrees formed an image on the wall in front of the mirror and behind the laser source. 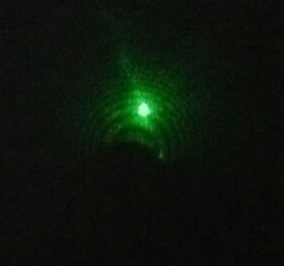 This image contained the reflected laser and near it the center of a interference pattern with fringes. Moving the laser closer to the mirror without changing angle of incidence had no effect whatsoever on the fringes. But when moving the angle of incidence the fringes moved away from the center when increasing the angle and towards the center when decreasing it. The interference pattern seems to be partially blocked by the laser light source and my hand. Possibly the interference was caused by a reflective component inside of the laser that bounced the light back a second time on itself.